The MHF have written to prime minister David Cameron and deputy prime minister Nick Clegg to ask how the new government will be moving the men's health agenda forward. The Liberal Democrat leader has a long-standing interest in men's issues. Last year, he famously rushed hot footed from a Commons sitting to join Peter Baker on the podium at the Westminster-launch of the Coalition on Men and Boys report Man-made. 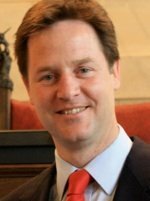 Website editor's blog, November 2009: A breathless Nick Clegg.